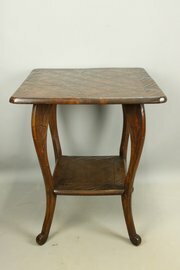 A Japanese side or tea table, probably imported by Liberty & Co as part of their Eastern Furniture Ranges, and dating to circa 1910. Typically carved with Chrysanthemum or other flowers, they were imported unassembled, and could easily be sent mail order, with each piece numbered for assembly. 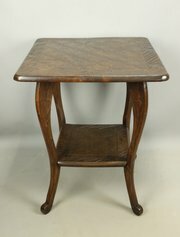 This table is in good condition, commensurate with age, and is a little larger than the usual side tables so more likely intended for tea. It measures 67cm high, with the top 57cm by 58.5cm.